Iaido is a Japanese martial art that trains in techniques of the sword. A real Japanese sword (katana), practice sword (iaito) or wooden sword (bokuto) is used in iaido practice. The term 'Iai' is taken from the Japanese phrase: 'Tsune ni ite, kyu ni awasu'. The meaning of this is, whatever we may be doing or wherever we may be, we must always be prepar﻿ed for any situation. Iaido is not a sport. There is a pre-set form to an Iaido kata, which is studied endlessly.Students strive to achieve precision and power in their form. Along the way they learn balance, grace, and control both of the body and the mind. Iaido is mostly performed solo, where the practitioner executes various techniques against single or multiple imaginary opponents. Iaido does not focus on overcoming an enemy, but on overcoming one's own self; therefore, the only opponent in Iaido is the practitioner him or herself. 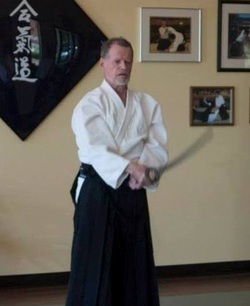 At the Abiding Spirit Center dojo, we train in the classical style of Muso Shinden Ryu, and also in the more modern techniques of the All Japan Kendo Federation Iaido Division. Or Center is the only place in the surrounding suburbs of Crystal Lake, Algonquin, Lake in the Hills, Elgin, Carpentersville, Cary, and Huntley to offer training in the traditional art.